If you cook Chinese dishes regularly, chances are high that you have Chinese five spice powder stocked in your pantry. 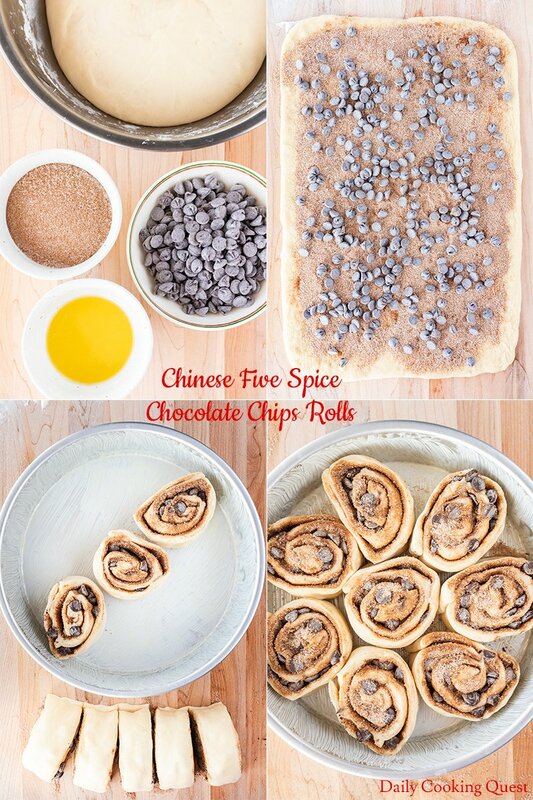 This Chinese five spice chocolate chips rolls is probably something most would not think to attempt, but once you give it a try, it seems such an obvious thing to do. 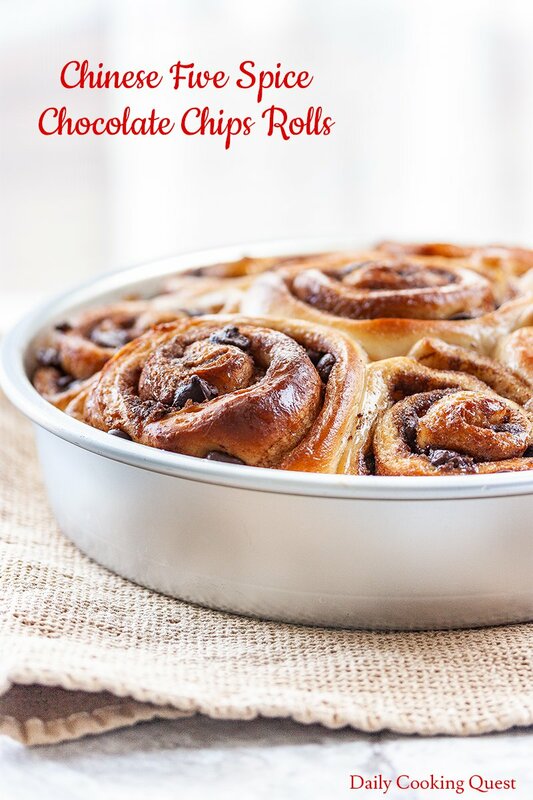 It elevates the more ubuquitous cinnamon rolls that we all know and love into something that is slightly more exotic, plus you get to finish that bottle of Chinese five spice powder for once. Cinnamon is one of the ingredients in Chinese five spice powder, along with star anise, cloves, Sichuan pepper, and fennel seeds. Once you take a bite into this bread, you immediately detect the familiar cinnamon aroma. The other four ingredients will of course be present, but I promise it won’t be that weird at all. 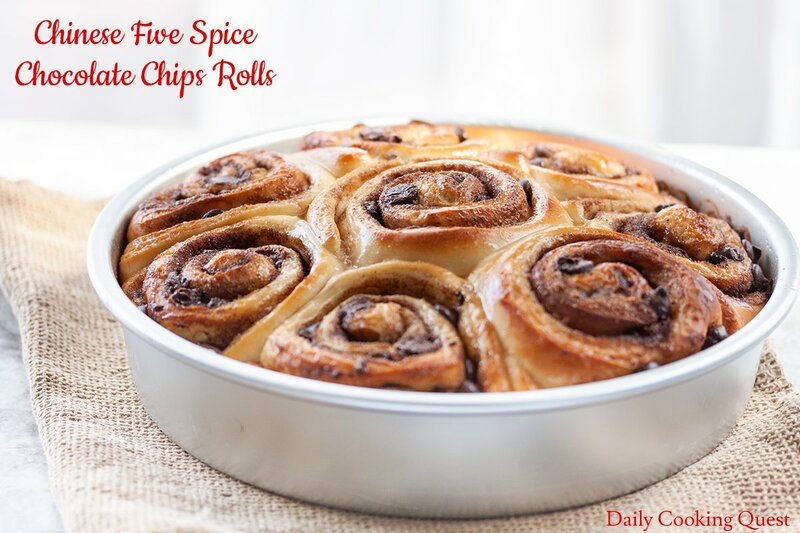 So please give this a try :) Of course, if you don’t already have some Chinese five spice powder at home, just use the same amount of cinnamon powder and make this into regular cinnamon rolls instead. Most cinnamon rolls you see comes with the requisite white glazing on top. I don’t exactly hate it per say, but my hubby always complains that he doesn’t like it. Cinnamon rolls are generally okay even without those glazing, but here I use chocolate chips instead of glazing to provide the sugar rush. He loves this version much better since he loves all things chocolate. And I love it too since it means less work for me not having to make the glazing. Most importantly though, chocolate chips pair surprisingly well with the Chinese five spice powder. Mix together active dry yeast, 5 gram sugar, and lukewarm milk. Set aside to bloom, or until foamy and frothy, about 10 minutes. In a mixing bowl, sift together all-purpose flour, sugar, and salt. Make a well, then add in egg yolks, butter, and yeast solution. Knead until smooth and soft, only adding a bit of flour if necessary. Kneading time is about 20-30 minutes. Place bread dough in a bowl, cover with a wet kitchen towel/saran plastic. Set aside to proof until volume is almost doubled, about 1 hour in a warm kitchen. Once the bread has finished proofing, punch down to remove air bubbles. Then transfer the bread to a lightly floured work surface. Knead for 2 minutes, then roll into a rectangle of about 8-inch by 14-inch. Brush melted butter evenly over the dough, leaving only about 1/2-inch uncovered. Mix together sugar and Chinese five spice powder, then sprinkle evenly over the buttered surface. Scatter the chocolate chips evenly over the surface. Preheat oven to 180 Celsius (350 Fahrenheit). Bake the bread in the preheated oven for 20-25 minutes. (Optional) If you love shiny looking bread, make the simple syrup by mixing together sugar with hot water. Once the bread is out from the oven, brush the top with simple syrup. These looks so amazing! The flavor combination is out-of-this-world delicious! Indeed Angela, this is one of those surprising instances where unexpected flavor combination works well together. OMG I am in love here. Chinese five spice is such a great spice, I cook with it all the time. But I never thought to use it in rolls like this - what a great idea! I know what you mean Danielle. I too only ever reach for Chinese five spice in savory dishes, but this bread roll turned out really well and now I am wondering if there are other cinnamon dessert out there that I need to play around with. What a unique flavor combination! 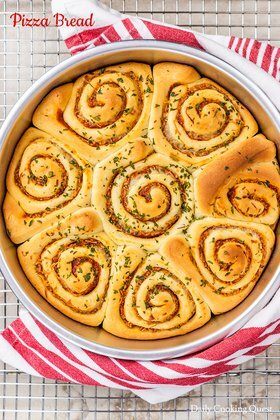 And I am absolutely loving that gorgeous close-up photo of the baked rolls. Makes my mouth water. 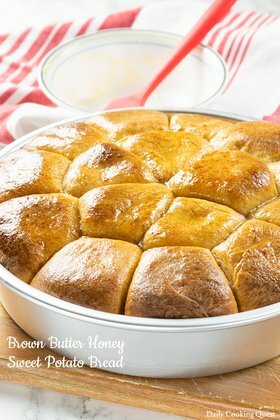 These rolls look so delicious and perfect for brunch! I was having them for breakfast AND tea time. My tummy was super happy, not so sure about my waist line. 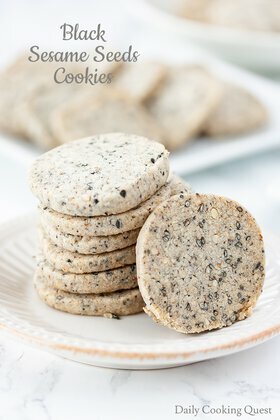 I cannot wait to try this recipe, how unique and delicious it must be! I have Five Spice in my pantry right now we love cinnamon rolls. 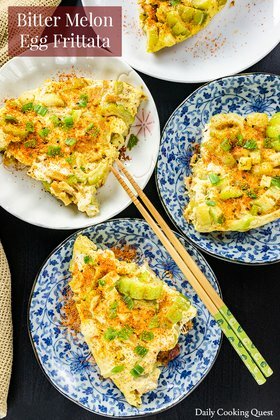 Great recipe and fabulous photos. Right? 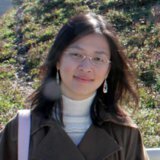 We all have Chinese five spice in our pantry. The trouble with me though, I finish maybe a couple gigantic bottles of cinnamon powder while my tiny bottle of Chinese five spice just sitting pretty. But no more, now I will be able to use it up before the dreaded expiration date.